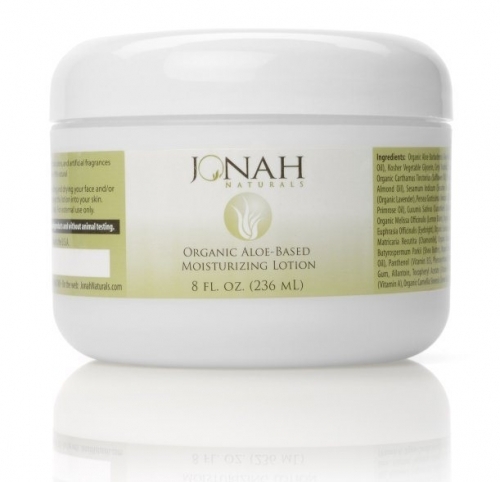 Jonah Naturals moisturizing lotion combines organic aloe, organic herbs, and a blend of nature's finest oils to promote and maintain soft, supple, and healthy skin. During winter months, between my wife, our two boys, and me, we go through several bottles of moisturizer - this natural, organic blend was created with our children in mind, as we're especially mindful about what we expose them to. Bottom line: if you have dry or extra dry skin, I'm confident that you'll be pleased with the texture, absorbability, and overall effectiveness of this moisturizer. Produced with no animal byproducts and without animal testing. Directions: Apply on face and body. Gently massage into skin. Reapply whenever necessary. May be used daily. If you're not completely satisfied by the results that you obtain from regular use of this aloe-based moisturizing lotion, simply let me know and I'll see to it that you're refunded in full (minus S&H). For face and body, comes in an 8-ounce wide mouth jar. As someone who has suffered from dry skin, I'm always looking for a GOOD body cream - one that's aloe based, low/no fragrance, quickly absorbed, and effective. This is IT and the price, compared to what I've paid for lesser quality products, is an excellent value. Thank you, Dr. Kim. I just love it! A cream for the whole family and the whole body! It is the most soothing and most moisturizing cream we've found yet that its worth the price tag! I bought this several months ago and have tried it twice as a facial moisturizer. Both times my skin broke out in tiny bumps on my forehead after a few days of use. I don't know which ingredient(s) I'm reacting to, and the ingredients list looks as though it contains only good and natural organic ingredients. But, sadly, I can't use this product on my face. I just received this lotion recently and it has worked well on my skin. I use it on my face after using the scrub and then the brightener. I was drawn to trying this after I read that it was fragrance free and that it goes well with the scrub and brightener. I've enjoyed using this product and would recommend it to anyone looking for a truly fragrance free lotion as it is light yet moisturizing. I love this product. It's an all over the body dream. I use it as a base to hold the fragrance of my perfumes on my body, as the perfumes are too strong for direct application on my skin. Also a tip! I never use my fingers to apply it. I don't want to contaminate the moisturizer with bacteria from my fingers so, I always apply it with Q-tips. It lasts much longer and will not break down the moisturizer in the jar. Do try this product. You'll not be disappointed. I love this lotion. It is thick and very moisturizing. I use it daily. This is my favorite moisturizing lotion, I love it! This cream has such a nice thick, yet not sticky, texture. I use it day or night. It has helped my dry skin! I have been using this cream for several years now. I LOVE it. I also use his organic face wash. Other "expensive" department store products used to make my skin break out, and I wanted to get away from fragrance and toxic chemicals in my face & body products, especially since learning most everything we put on our skin is absorbed into our bloodstream. Not only does this product contain organic ingredients, it is not greasy, and really helps my dry skin to feel softer and have a more youthful appearance. I especially love applying it right after I get out of the shower. Sometimes I use it twice daily. I am 52 years old and I am so happy to say I look and feel much younger - thanks, as well, to drinking a lot of filtered water and using Dr. Ben Kim's Organic Greens and Vitamin C.
This has the loveliest texture. It's like a cloud. In addition, I'm sure that fragrance-sensitive people appreciate that it's fragrance-free. This is my favorite moisturizer. I send some to my friend in California twice a year, for Xmas and her birthday, since she specially requested it. LOVE THIS LOTION. Having skin infection problems and this is the ONLY thing I can use on my hands. So soothing, non burning & odorless. LOVE LOVE LOVE IT! I have only used this moisturizing lotion for a week, but I am very impressed. I am particular about what I want, and this seems to fit the bill. It is moist without being sticky, and it stays smooth feeling under my makeup all day. I use it day and night. I am giving up my other moisturizer. Having just one to use is very helpful. We have tried literally every so-called natural lotion from health stores around our area and none of them can match this. No smell, not greasy, but so rich and hydrating. The quality and value are insane, we order ten jars at a time. Love the moisturizer which I'm using on my hands too and am astonished to find that it sinks right in, makes my skin comfortable and it isn't greasy, which was why I didn't want to use other hand creams until now. Love, love, love this lotion! I don't use it on my face because I have adult acne, but I do use it on my body every day. It is thick and creamy and glides on well. It absorbs nicely and never leaves a greasy feel. I also like that it doesn't have a strong scent. It's the only lotion I will use now and I love that you switched to a jar instead of a pump bottle. Much improved!! The perfect lotion has to glide on nicely, absorb well, and not be sticky. This lotion has met those requirements. My husband and I both love it. I use it on my face in winter, but some may find it a bit heavy for that purpose. A great overall body lotion. I indend to order several more jars. This is a wonderful cream. It is both light and luxuriuos and absorbs easily with no residual stickiness. Truly a winner!! Great lotion. I work out in the sun all day and f use it on my face at night. Soaks in without the greasy feel. I love the texture of this lotion and how it absorbs so quickly! I also use the coconut oil as a moisturizer but with the cold winter months here the coconut oil stays solid and so it was more convenient to use this product and it seemed to moisturize better. I'm ordering several more bottles to keep around the house for use after all hand washings. I like this lotion a lot - but I've now bought 2 bottles and both have come with pumps that completely don't work. I still use the lotion, but it was a disappointment. This is great lotion. I developed eczema on my legs as per dermatologist. I was not convinced (as I am 40 and never had it before) but no lotion could help itcheness go away. I was lucky to stumble upon this lotion. Not only it went away, but I do not have the bumps the redness anymore. It cured it. And I have tried many creams, lotions, and Whole foods beuty items that claimed to be a cure. Highly recommend this lotion. This is the best lotion I have ever used. It only takes a little bit, is grease-less, and keeps skin hydrated. I will definitely order more. This Moisturizing Lotion smells very nice and feels nice on the hands and body. It has great texture. But, I would not recommend it for facial use, especially if you have sensitive skin. I experience some itching when I use it on my face. I prefer this lotion over the light version. Hi Dr. Ben Kim, you did great on the lotion formulation, it is wonderful. It is thick, creamy, and smooth, but the best part is how fast it absorbs into my skin without a greasy texture. I will be getting more of this when I run out, Peace, Rena.